SEATTLE (AP) At this point, there is not much Corey Kluber can do to strengthen his case for the American League Cy Young Award. Another win, another quality start, another 10 strikeouts has become what is expected from Cleveland’s ace. Kluber threw seven strong innings to become the first 18-game winner in the AL, Jose Ramirez’s 29th home run snapped a 2-all tie, and the Indians beat the Seattle Mariners 4-2 on Sunday. Kluber (18-4) made only one mistake in winning his sixth straight start, striking out 10 and allowing six hits. It was his 15th start this season with at least 10 strikeouts. And Kluber didn’t feel at his best after getting extra rest before this turn in the rotation. ”Just didn’t quite feel as crisp as when you get to go every fifth day, but it’s about making adjustments,” Kluber said. Ben Gamel had a two-run homer with two outs in the fifth inning to pull Seattle even and snap a string of 26 2/3 scoreless innings by Kluber. Both of the runs were unearned after an error by Giovanny Urshela. But it was the only offense the Mariners could produce against Cleveland’s ace. The Indians won for the 29th time in 31 games, won their ninth straight series and have not lost consecutive games since Aug. 22-23. The loss eliminated the Mariners from contention for the second AL wild card. Seattle is seven games behind Minnesota with six games left. The Mariners have not made the postseason since 2001. Ramirez put Cleveland in front leading off the sixth with a solo shot off Seattle starter Mike Leake (3-1) and put Kluber in line for the victory. Cleveland also got RBI doubles from Edwin Encarnacion and Jason Kipnis in the fourth. 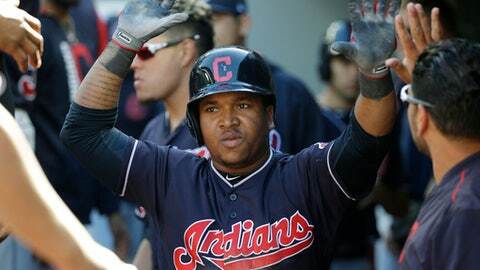 Encarnacion later doubled in the eighth off reliever Shea Simmons and scored on a sacrifice fly from Kipnis. Brian Shaw pitched a clean eighth, and Cody Allen worked the ninth for his 29th save. Allen allowed a game-ending home run to Nelson Cruz in Friday’s loss but struck out two of three batters in the ninth on Sunday. ”We knew (Allen) was fine or he wouldn’t be pitching,” Indians manager Terry Francona said. Leake was lifted after 6 2/3 innings, the third time in five starts since being acquired by Seattle that he pitched into the seventh. The right-hander pitched into the seventh just twice in his final 10 starts with St. Louis. The three earned runs were the most allowed by Leake since his addition to the Mariners rotation. Seattle has the longest postseason drought in baseball at 16 years and counting. The Mariners were in the middle of the wild card race until the past 10 days, when they were swept by the Astros in Houston and swept at home by Texas. Seattle has dropped eight of nine. Indians: 1B Carlos Santana was out of the lineup a day after having his right arm bent awkwardly in a collision at first base with Seattle’s Jean Segura running down the line. … RF Jay Bruce was back in the lineup after leaving Saturday’s game early with left heel soreness. Mariners: Seattle was without starting SS Jean Segura on Sunday, and he may miss a few more games with a sprained middle finger on his right hand. Segura was hurt in Saturday’s game. Servais said it would probably be a few days before Segura will be back in the lineup. Indians: Cleveland has Monday off before opening a three-game series at home against Minnesota. Josh Tomlin (9-9) will start the opener. Mariners: Seattle goes on the road for its final six games, beginning with three against Oakland. Felix Hernandez (5-5) will start the opener against the A’s.